The Dada Art Movement, or Dadaism, is believed to have begun in Switzerland around 1915-1916 in reaction to the outbreak of WWI. This loosely-banded group of writers and artists actively protested against the war and the principles they felt were responsible, such as: nationalism, materialism, rationalism and, most importantly, traditionalism. These were "non-artists" in the process of creating "non-art." Dada artists delighted in creating a Dadaism art that was both whimsical and nonsensical, designed to create outrage or shock among viewers. The only rule was to follow none of the traditional rules. There was no one particularly predominant medium used in Dadaism. 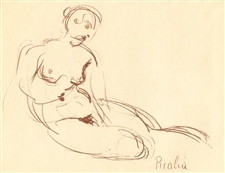 Some of the principle figures of the international "non-movement" included Jean Arp, Marcel Duchamp and Francis Picabia, among others. Many participants were influenced by Expressionism and Abstraction. Dada, in turn, was a forebear of Surrealism. 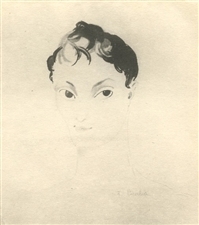 Some fine examples of Dada prints and Dada Surrealism Art are available here. Jean Hans Arp 1956 pochoir "Configuration"
Medium: pochoir (after the collage). Printed by pochoir master Daniel Jacomet in 1956 for XXe Siecle (issue number 6 "Le papier colle du Cubisme a nos jours"), published in Paris by San Lazzaro. Sheet size 12 1/4 x 9 1/2 inches (315 x 245 mm). Not signed. Medium: original woodcut. Executed for the front cover of Derriere le Miroir (No. 33) in 1950, and published in Paris by Maeght. Sheet size: 15 x 11 inches (380 x 280 mm); with text printed above the woodcut and on back of the sheet, as issued (the text shows through slightly). Signed in text with the printed letters ARP, not hand-signed. Jean Hans Arp silkscreen "Place selon les lois du hasard"
Medium: serigraph / silkscreen. The title translates to "Place According to the Laws of Chance". Published in 1964 by Galerie Denise Rene, of Paris, for the rare exhibition catalogue "Hard Edge". Jean (Hans) Arp was one of several artists who contributed original silkscreens for this project (after their own paintings). It was printed by the Imprimerie Mazarine on a sheet of thin wove paper without margins, and then tipped onto a support sheet (attached along the top edge). Image size: 7 x 5 7/8 inches (190 x 150mm). Not signed. Medium: original woodcut. Issued in a limited edition of 995 and published in Paris in 1949 by Maeght for "L'Art Abstrait", a rare volume investigating the origins and theory of abstract art. Printed on wove paper, the full sheet measures 9 x 7 7/8 inches (230 x 200 mm). Not signed. Jean Hans Arp pochoir with cut-outs "Constellation"
Medium: pochoir with cut-outs and shiny silver paper background (after the collage). Printed in Paris by the atelier of Daniel Jacomet, and published in 1955 by Berggruen. The image measures 4 1/2 x 3 1/2 inches (120 x 90 mm). Not signed. Medium: original woodcut. 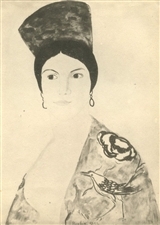 Executed for the back cover of Derriere le Miroir (No. 33) in 1950, and published in Paris by Maeght. Sheet size: 15 x 11 inches (380 x 280 mm); with text on verso, as issued (the text shows through slightly). Signed in text with the printed letters ARP, not hand-signed. Jean Hans Arp pochoir "Symetrique aux flocons du hasard"
Medium: pochoir (after the collage). Printed in Paris by the atelier of Daniel Jacomet, and published in 1955 by Berggruen. The image measures 4 1/4 x 3 5/8 inches (110 x 94 mm). Not signed. 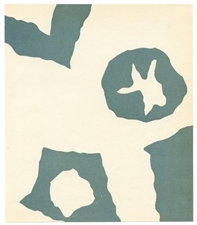 Jean Hans Arp pochoir "Constellation"
Medium: pochoir (after the collage). Printed in Paris by the atelier of Daniel Jacomet, and published in 1955 by Berggruen. 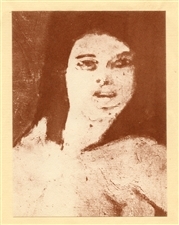 The image measures 4 1/4 x 3 inches (110 x 75 mm). There is another Jean Arp composition printed on the back of the sheet, as issued. Not signed. Jean Hans Arp pochoir "Presque vase et fleurs"
Medium: pochoir (after the collage). Printed in Paris by the atelier of Daniel Jacomet, and published in 1955 by Berggruen. The image measures 4 1/2 x 3 3/4 inches (115 x 98 mm). There is another Jean Arp composition printed on the back of the sheet, as issued. Not signed. Medium: silkscreen with cut-outs (after the oil on cardboard with cut-outs). This interesting piece (photographed here against a white background) features die-cut empty space, representing the table and anchors. 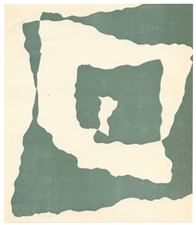 Published in New York in 1958 for a Museum of Modern Art exhibition catalogue, there is a printed text inscription 4mm beneath the image (enough space to mat over and leave margins on all sides). Image size: 7 1/2 x 6 inches (190 x 152mm). Not signed. 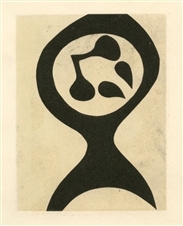 Jean Hans Arp pochoir "La Pendule"
Medium: pochoir (after the collage). Printed in Paris by the atelier of Daniel Jacomet, and published in 1955 by Berggruen. The image measures 4 1/4 x 3 1/4 inches (108 x 84 mm). There is another Jean Arp composition printed on the back of the sheet, as issued. Not signed. Jean Hans Arp pochoir "Dessin dechire"
Medium: pochoir (after the collage). Printed in Paris by the atelier of Daniel Jacomet, and published in 1955 by Berggruen. The image measures 4 1/4 x 3 1/4 inches (110 x 85 mm). There is another Jean Arp composition printed on the back of the sheet, as issued. Not signed. Jean Hans Arp pochoir "Collage Trompe-l'oeil"
Medium: pochoir (after the collage). Printed in Paris by the atelier of Daniel Jacomet, and published in 1955 by Berggruen. The image measures 5 1/4 x 3 1/4 inches (135 x 82 mm). There is another Jean Arp composition printed on the back of the sheet, as issued. Not signed. Jean Hans Arp pochoir "Configuration Geometrique"
Medium: pochoir (after the collage). Printed in Paris by the atelier of Daniel Jacomet, and published in 1955 by Berggruen. The image measures 4 1/4 x 3 1/2 inches (110 x 90 mm). There is another Jean Arp composition printed on the back of the sheet, as issued. Not signed. Medium: pochoir and phototype (after the collage). Printed in Paris by the atelier of Daniel Jacomet, and published in 1955 by the Galerie Berggruen for the cover of a rare catalogue. Size: 8 5/8 x 4 1/2 inches (220 x 115 mm). Not signed. Condition: as this was the actual cover, there is wear and soiling.